But, which is better? If you’re seeking an alternative to a ‘built-in fireplace’ – then a stove may not be what you’re looking for. The decision between a gas or electric fireplace however, may not be as simple as this. To help your decision just that little bit easier, we’ve weighed up the benefits of both. 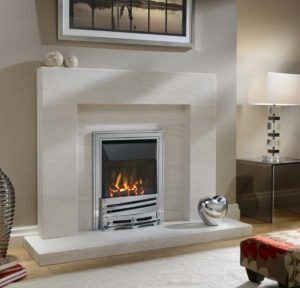 Gas fireplaces first came into prominence as a popular alternative to wood-burning fires. This was mainly down to their efficiency, price and cleanliness. Wood-burning fireplaces used to create a lot of smoke and soot, whereas gas fireplaces removed these by-products entirely. Not only this, but the relative speed in which a gas fire could alight was much greater than that of your traditional wood fireplace. Come the 1900s, gas fireplaces had become a popular alternative to their wood-burning predecessor. If your house has a pre-existing gas line, then you can introduce a gas fireplace without any other modifications, making it a relatively easy installation. If your home does not have a gas line however, then the installation of one can become complicated. It has been a popular alternative to the traditional fireplace for decades. Making it trustworthy and reliable. The gas fireplace is known for its high heating speeds and cost efficiency. They create real flames – promising that warming ambient effect. Traditional gas fireplaces weren’t typically the most appealing on the eye. Now, however, you can browse a wide range of aesthetically pleasing gas models. There’s a style to suit all. They are easy to control. To tame the flames of a gas fire you simply have to reduce the gas flow (this is often done through a remote or a button). Gas fireplaces are environmentally friendly. With no wood being burned or smoke emitted, gas fireplaces have zero emissions. They are more efficient in heat generation than both electric and traditional fireplaces. The first electric fireplace was invented in 1912 but they only became popular in the 1950s, so slightly later than the gas fire. They are well known for their ability to imitate a roaring fire through visual lighting affects, but without producing any of the harmful emissions. Electric fireplaces are often easy to install and are a popular choice amongst those with no flue or gas line to fit an alternative fireplace model. Gas or Electric? Which is better? Both have their fair share of pros and cons, but can one ever outweigh the other? We say that when it comes down to the debate of gas vs. electric, it really does depend on your home and circumstance. If your house is equipped with a gas line then a gas fireplace would be easy to install and you can then enjoy its warming, efficient and environmentally friendly benefits. On the other hand however, if your house is without a free gas line then the installation of a gas fireplace can be tricky and expensive. 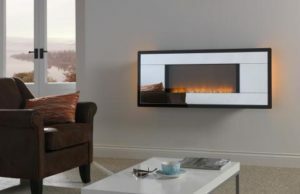 In this case, a contemporary electric fireplace may be the one for you. Boasting the benefits of being less hot to the touch and generally safer – this model may just be the one for you. For more information on which fireplace is right for you, contact us today.